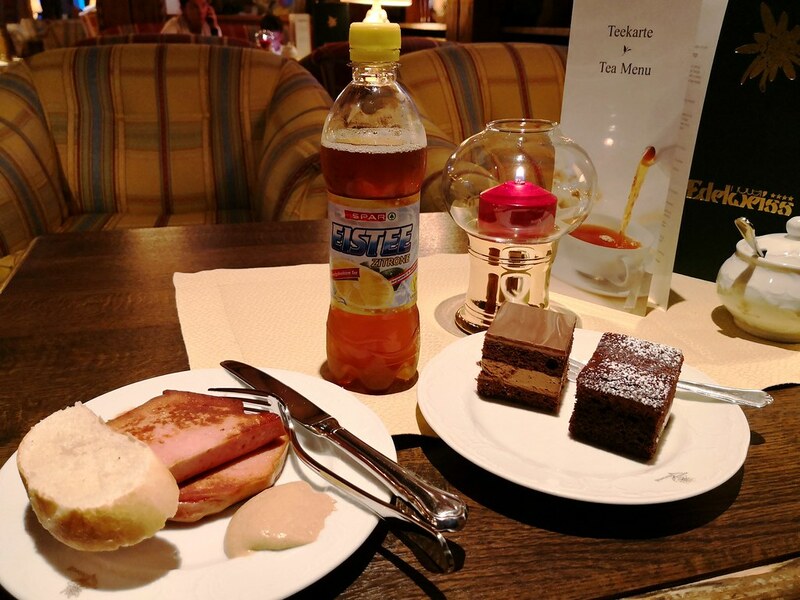 Welcome to the second part of my review during my 5 day stay in the Skihotel Edelweiss. This instalment will mainly cover the half board and dining options that was included in my room rate. For those who are not familiar with half-board, it just means breakfast and dinner is included. 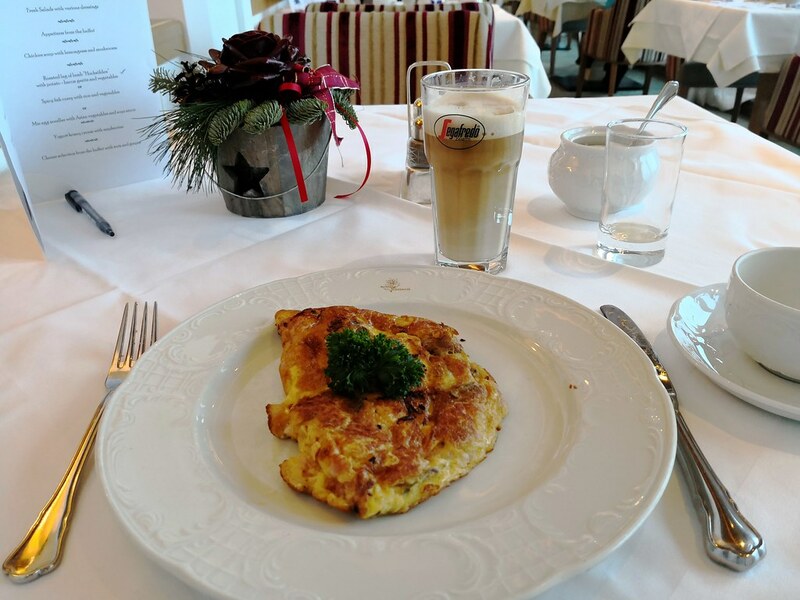 Normally it is not my preferred mode of accommodation as I like to explore food options when travelling but many ski resorts works best on this option especially so in Hochsölden where there are few dining options aside from the hotel you are staying at. The village at Hochsölden only have a handful of hotels and it is likely their restaurants cater to only their guests, making it difficult to stay in Hochsölden and not going for a half board since it takes time and additional cost to get to the village in Sölden where the bulk of restaurants and pubs are located at. 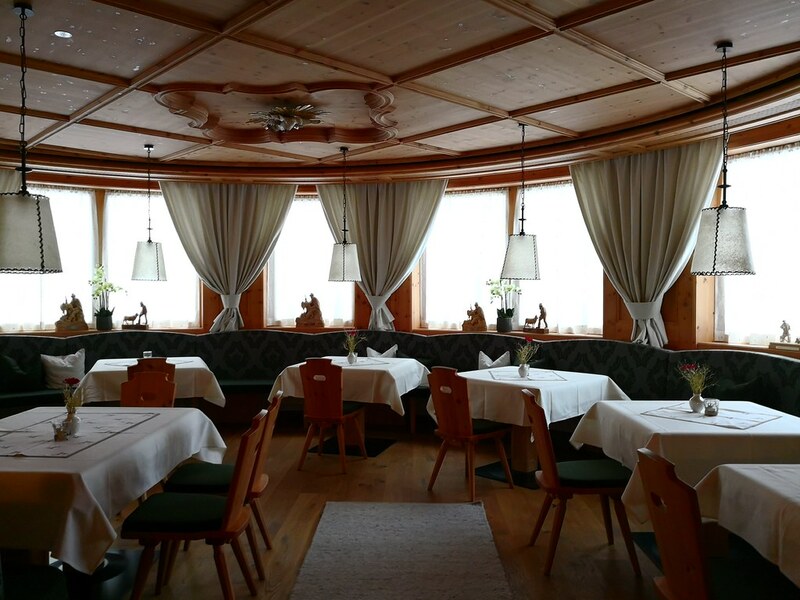 There is only one main restaurant in Skihotel Edelweiss though the restaurant is split into 2 distinct spaces. As the hotel was not full, only the main space is open for dinner and breakfast. 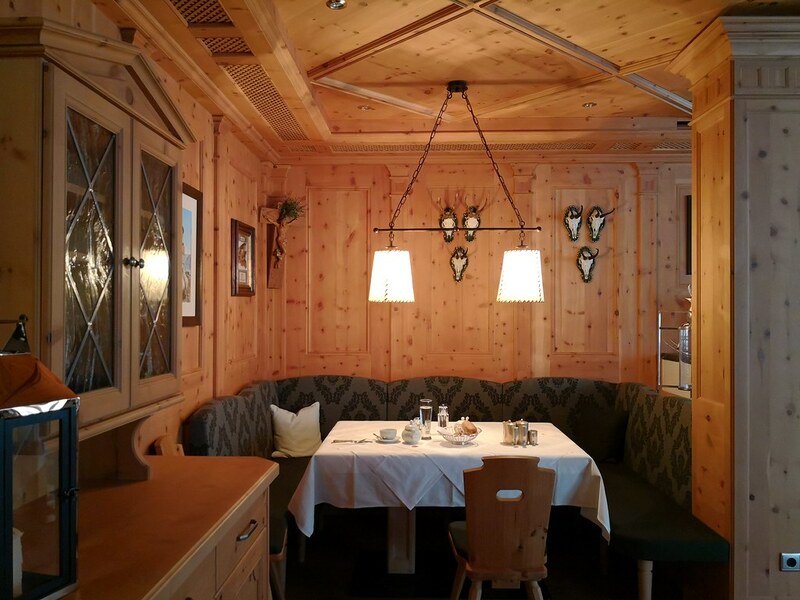 The second restaurant space is in a more traditional Tyrolean style and seems more suited like a breakfast room. 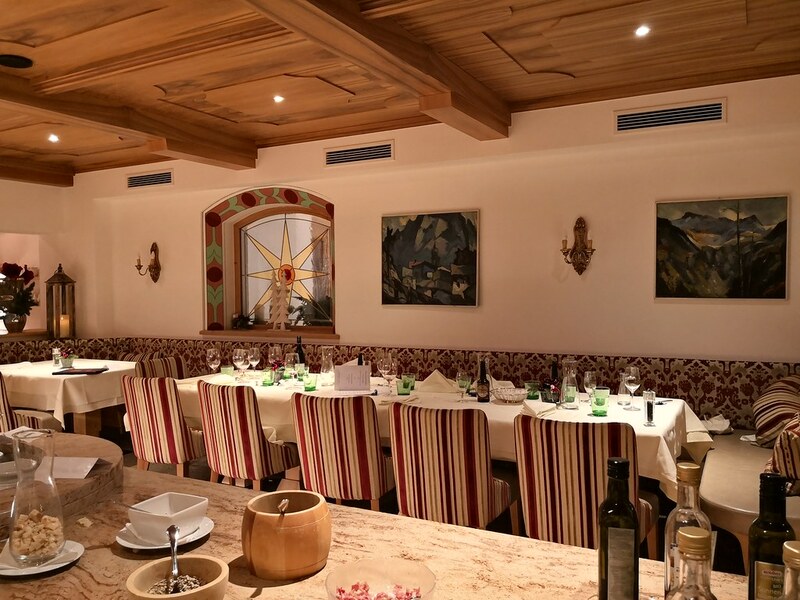 The main restaurant seems to be furnished in a more contemporary style yet retaining Tyrolean touches. Unlike the usual restaurants with regular square tables, the seating plan here is more versatile, allowing for larger groups of 10-12 people as well as for families in groups of 5-6 people. This is due to the hotel taking in group bookings on ski vacations along with families on holidays. 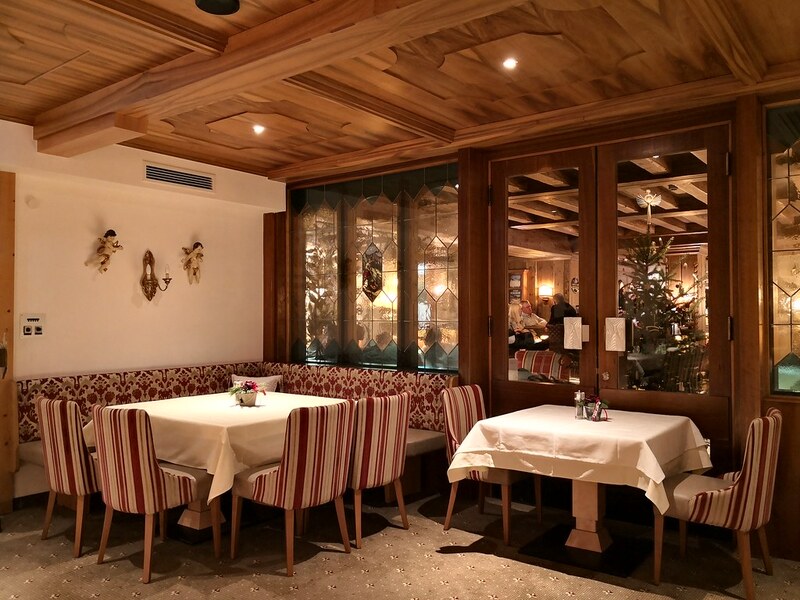 In addition, the restaurant has a dedicated space at the end for couples that prefer a quieter area. This space is further from the main buffet table but it overlooks the valley and thus has a nice view in the day, meaning it one of the preferred spaces. Common for guests on a half board, the tables have been pre-assigned based on your room number and that meant I had a set dining spot reserved for me throughout the 5 days of dining in the hotel. 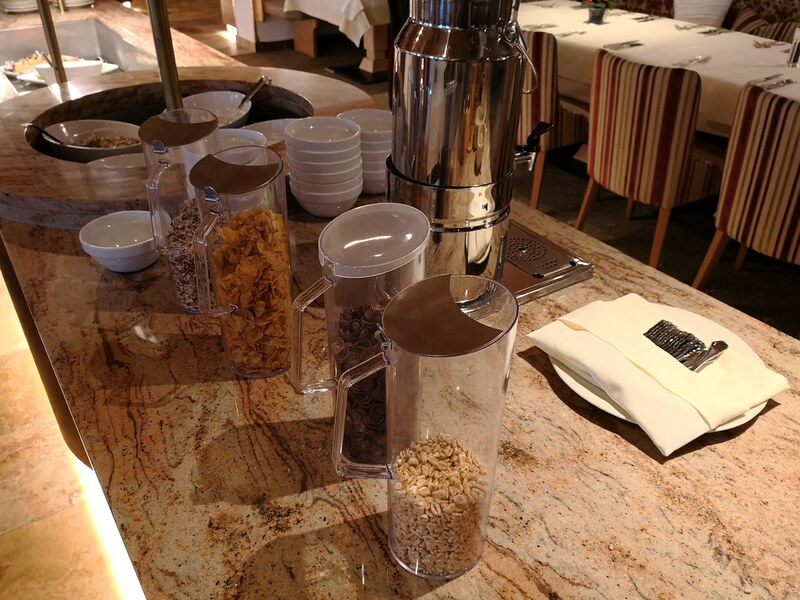 Breakfast is served from 8am to 10:30am which is slightly later than what I expected for a ski hotel. Since the slopes open at 9am, I would definitely prefer to have my breakfast at around 7am so I can be ready at 9am all while having a leisurely breakfast. 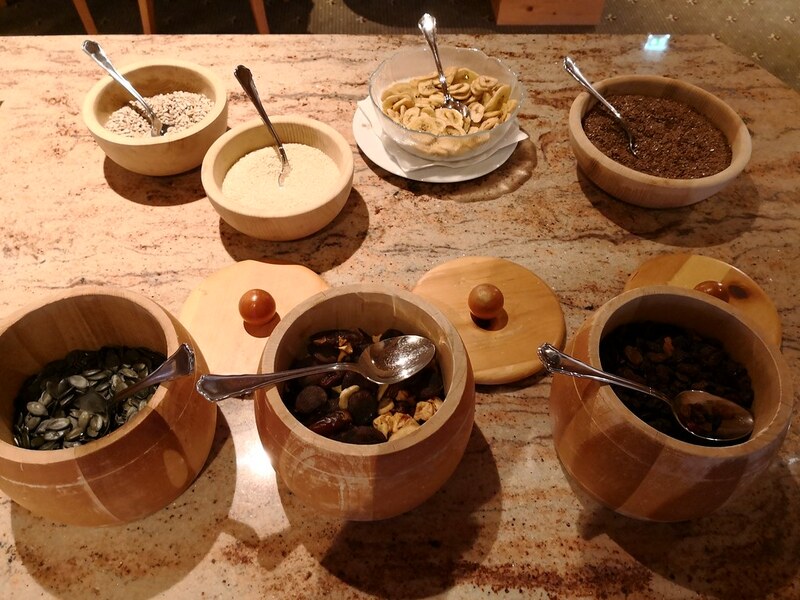 The centre buffet table starts with several bowls containing freeze-dried bananas, dried nuts and berries. 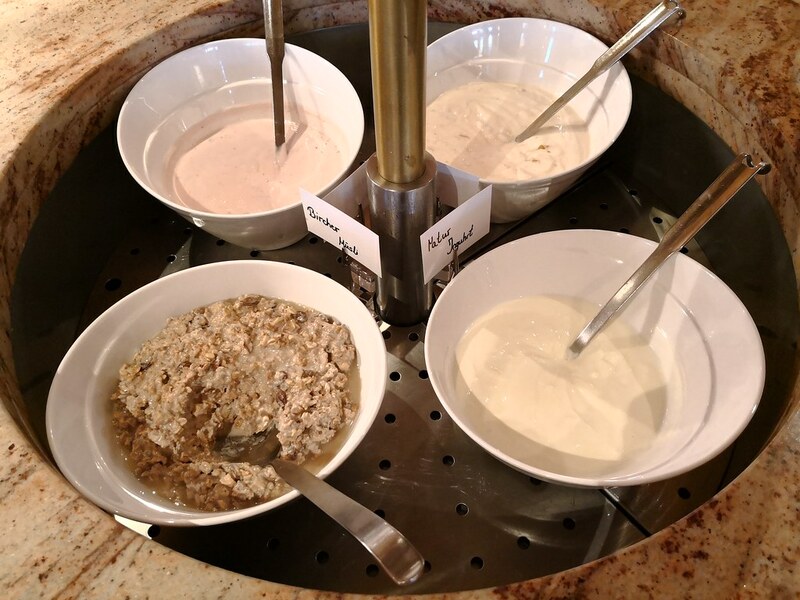 Beside it there was several type of cereals with a milk dispenser and in the cold section there are large bowls of yogurt and muesli. 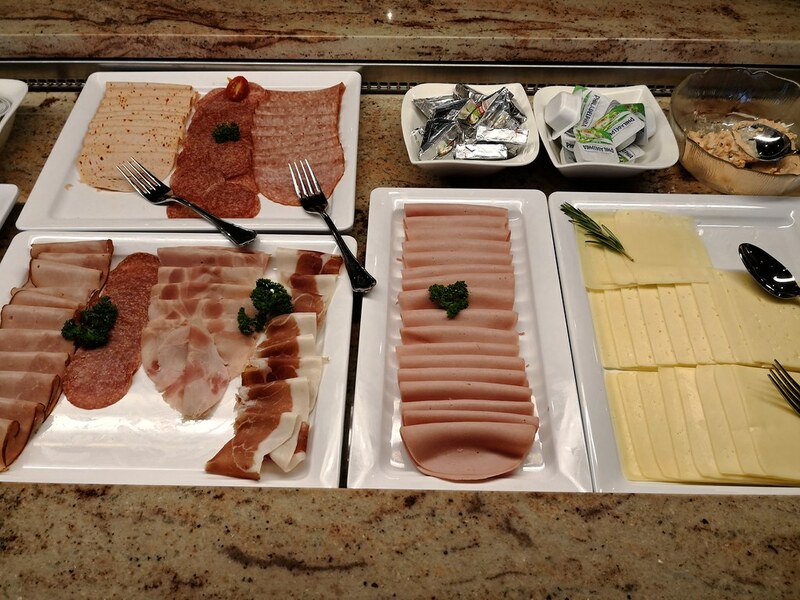 Like all continental breakfast buffet, there is a nice variety of cold cuts ranging from Tyrolean speck to 2 types of smoked fish. Found alongside are a good variety of hams and cheese. 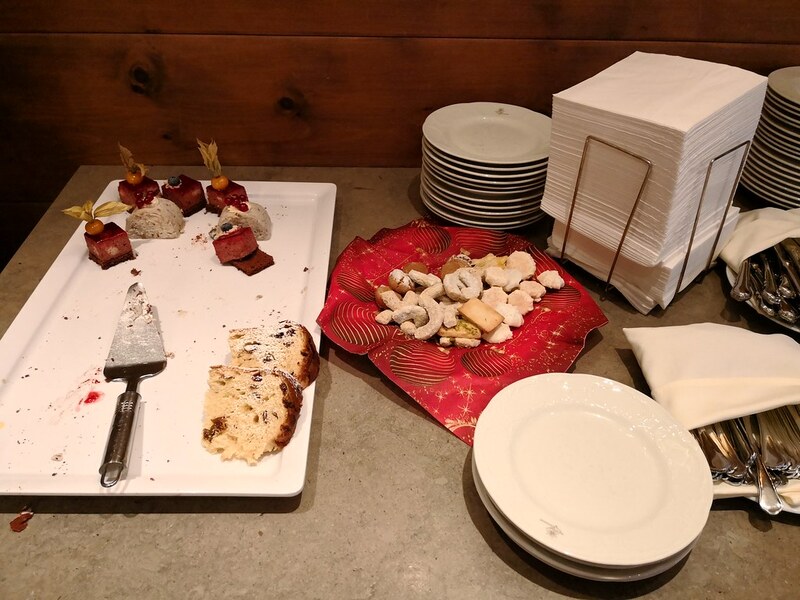 Scattered amongst the charcuterie selections, there was bowls containing individual portions of cream cheese and liver spread. Yes you heard the last one correctly as liver terrine is a thing served for breakfast and they do taste reasonably nice on toast actually. As I am not used to how this should be enjoyed, maybe my readers can enlighten me on how best to enjoy liver spread. 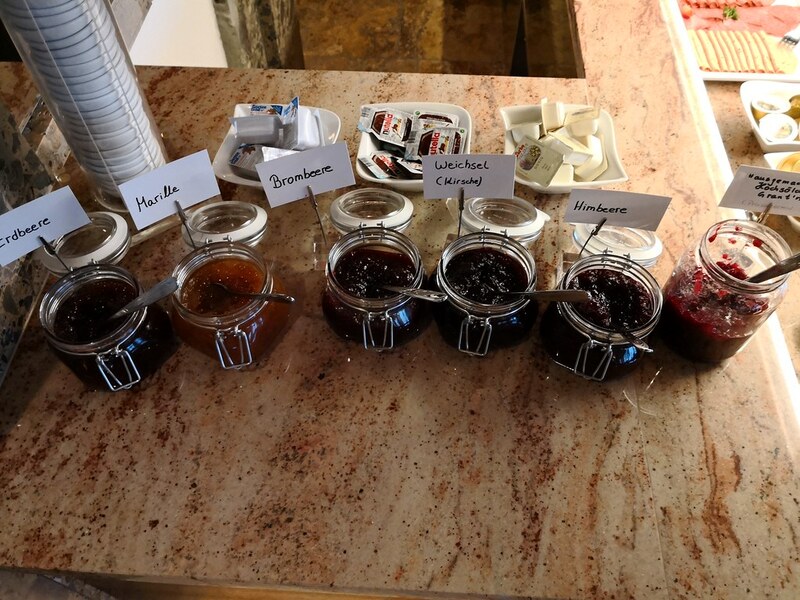 Speaking of things to add to your toast during breakfast, what about an assortment of preserves or individually packed butter, margarine and nutella. Those little nutella packs makes a great sweet snack too for kids if I must say. 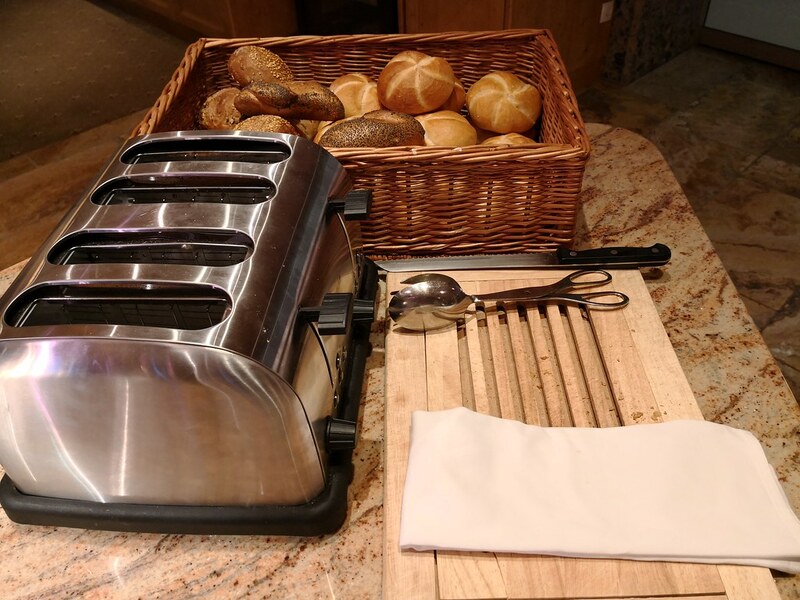 In case you were wondering where the toast are, they can be found beside the espresso machine. There are even a selection of crackers for those lazy to make their own toast. Other baked goods includes an assortment of buns and sweet pastries. Diners can certainly burn off those sugars on the slopes later! 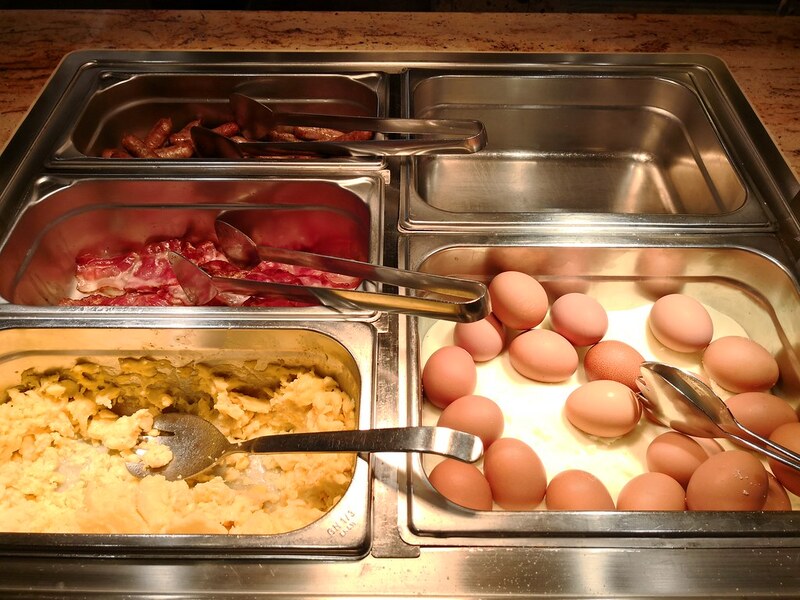 For the hot options, the buffet seems more limited as there was just a selection of bacon, sausage, scrambled eggs or boiled eggs. However it is also possible to order eggs made to your liking such as omelettes or sunny side ups, both of which I ordered on different days. 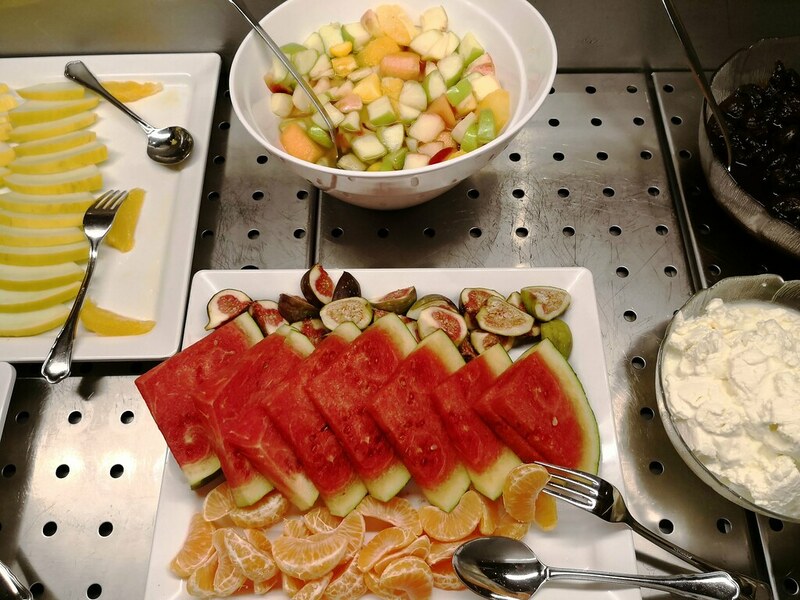 Finally there are sliced fruits provided on the buffet table to end the breakfast selection. 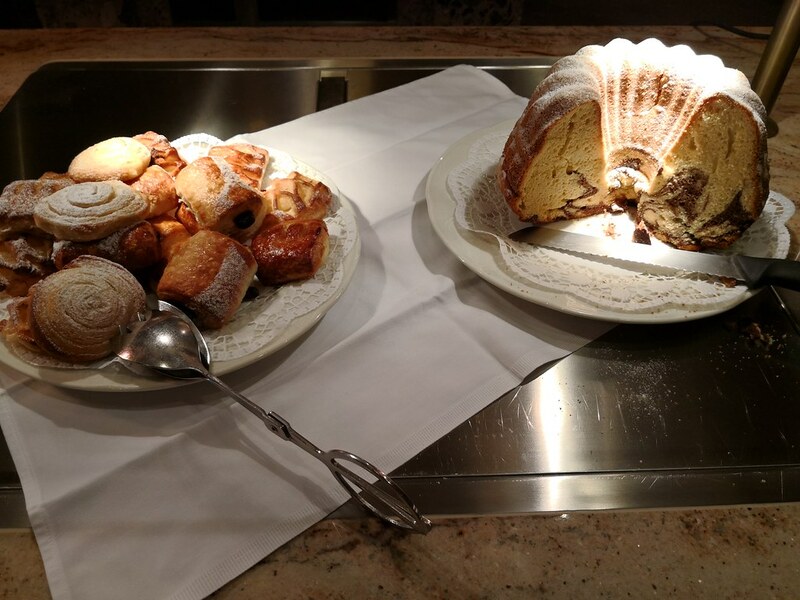 Comparing their breakfast buffet, I find the pastry selections to be slightly limited and there does not seems to be anything different from day to day in the variety. Furthermore, the sunny side up and omelettes are not always cooked well so I would rate the breakfast here to be average. It certainly will be filling enough for the morning but it is not extraordinary. 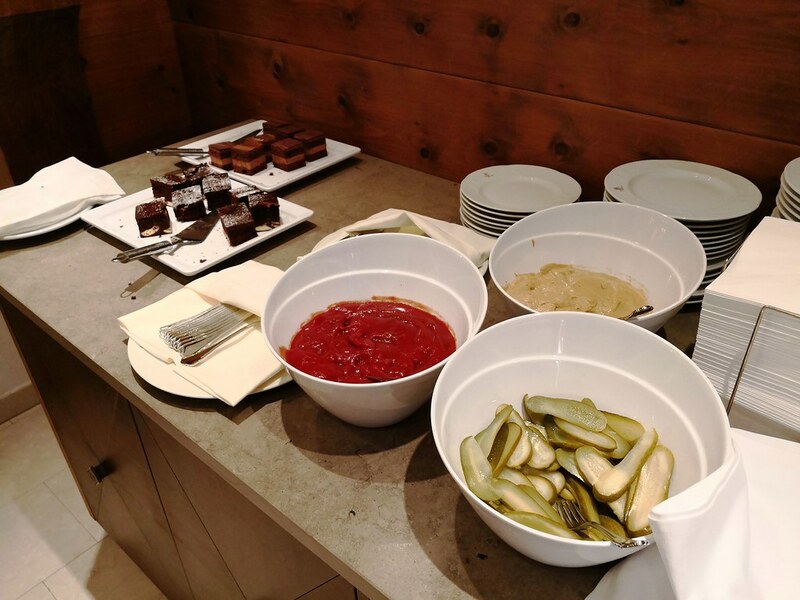 An aprés-ski snack was served to guests on the hotel and for this service, there does not seem to be any check as it seems to be complimentary to all guests staying in the hotel. 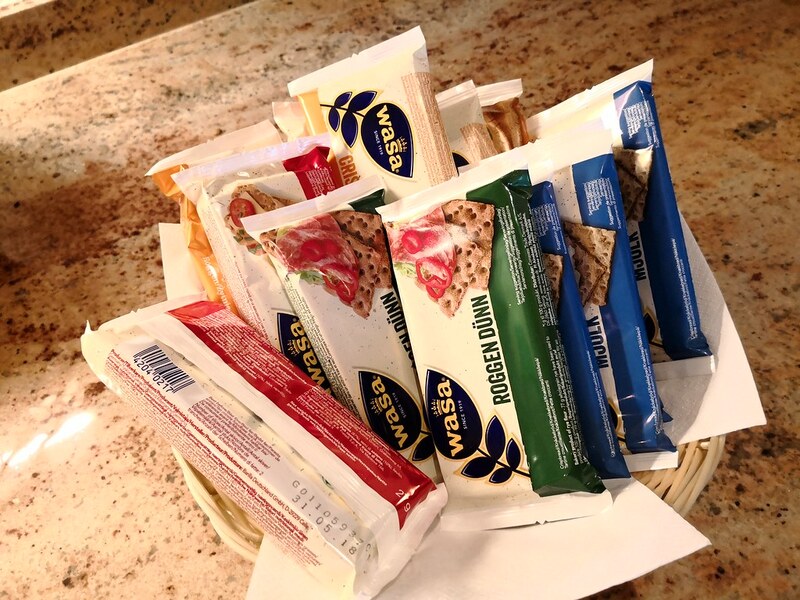 This snack service is served across from the reception desk by the stairwell. Guests could enjoy the snacks in the lounge area or by the bar where there always seems to be seats. Served from 3:30om to 4:30pm, there does not seem to be any top ups to the food served when it runs out so if you are feeling hungry, do come early. On the days I was there, they did change the selection provided, ranging from lasagna to luncheon meat to sausages. In addition to the savoury food, there is usually a range of cookies and cakes or tarts as the sweet treats. Food selection during this service is more like what one can find in a small hotel club lounge and works more as a pre-dinner snack to tide one over. 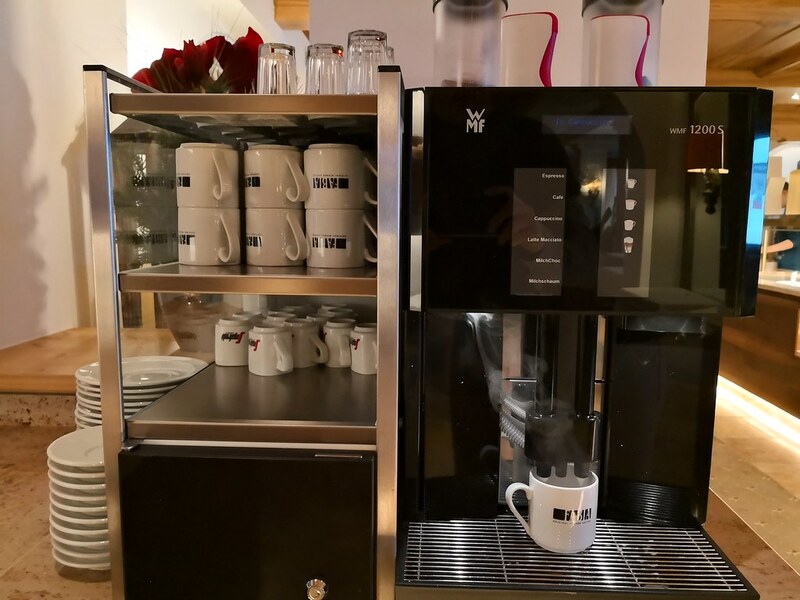 By providing this free service, the hotel is actively promoting their bar drinks as well since no beverage was provided during the service. As a guest, while limited in food type and quality, this was better than nothing so it is the thought that counts. 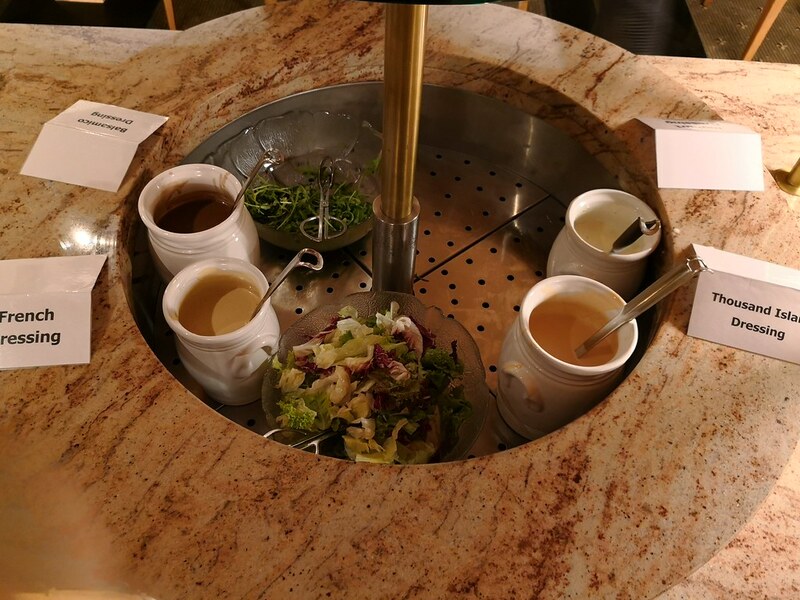 Every day for dinner, the salad is on a DIY format with diners making their favourite vegetable combination bowls and topping it using a wide range of condiments, vinegars and oils. While there might be variations on the vegetables provided, they were all fresh and crunchy. 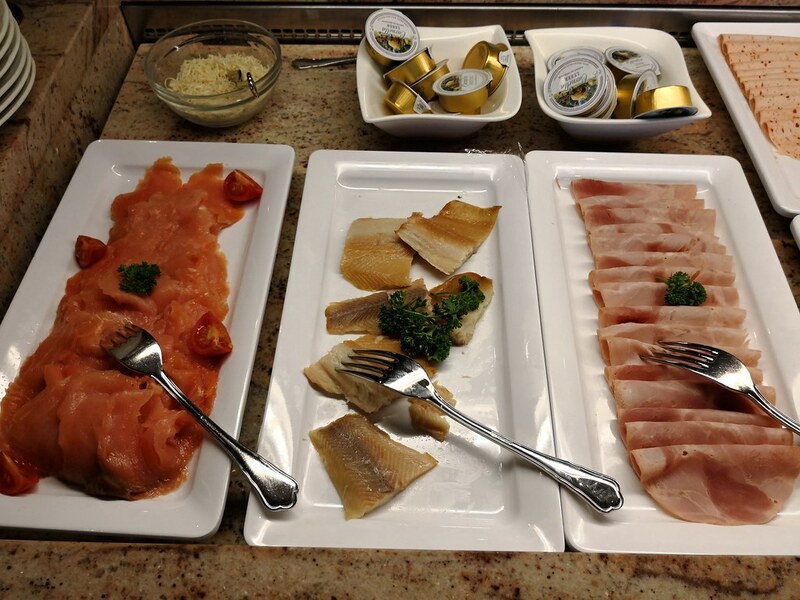 On some days marinated beef slices or smoked salmon was available as well. 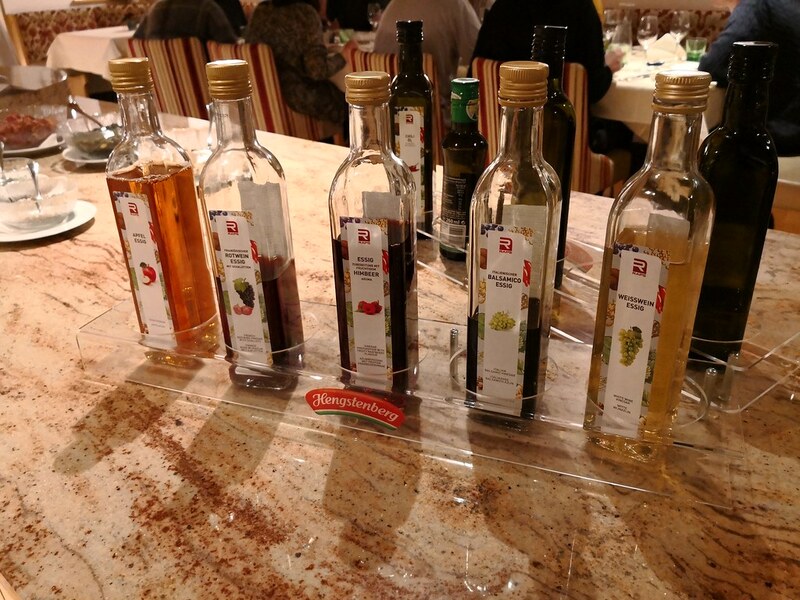 Another highlight on the salad bar was the flavoured balsamic vinegar ranging from apple to raspberries to a spicy chilli one. 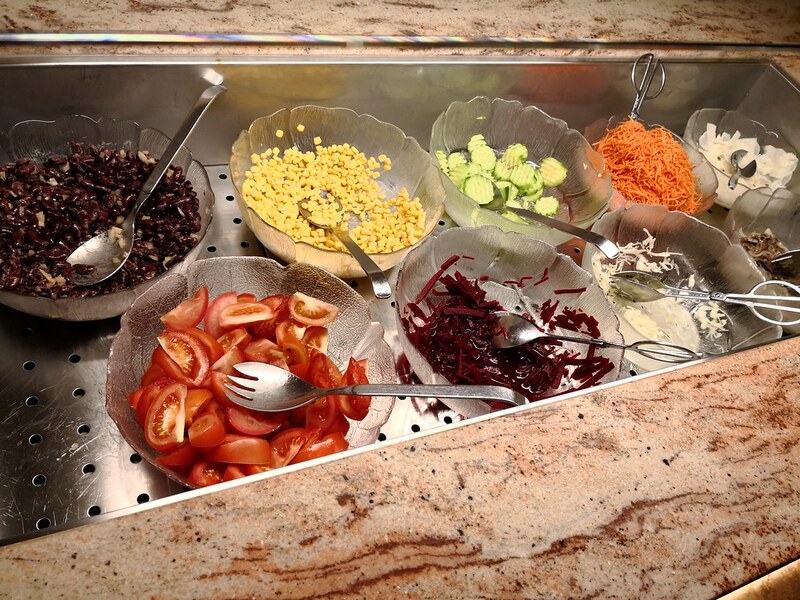 If you prefer your salad with dressings, several classic dressings on bowls were prepared as well. 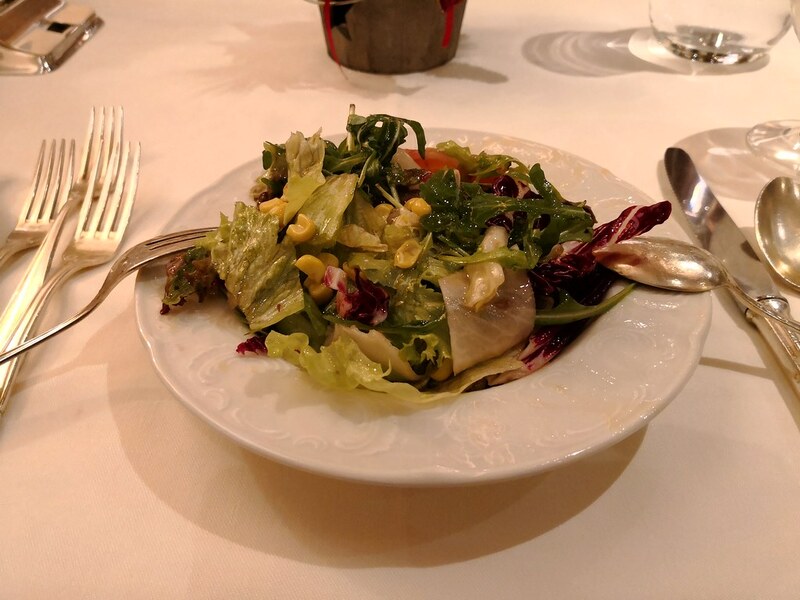 With the fresh vegetables and availability of different flavoured vinegars and oils, it was easy to customize a salad to the one I enjoy. 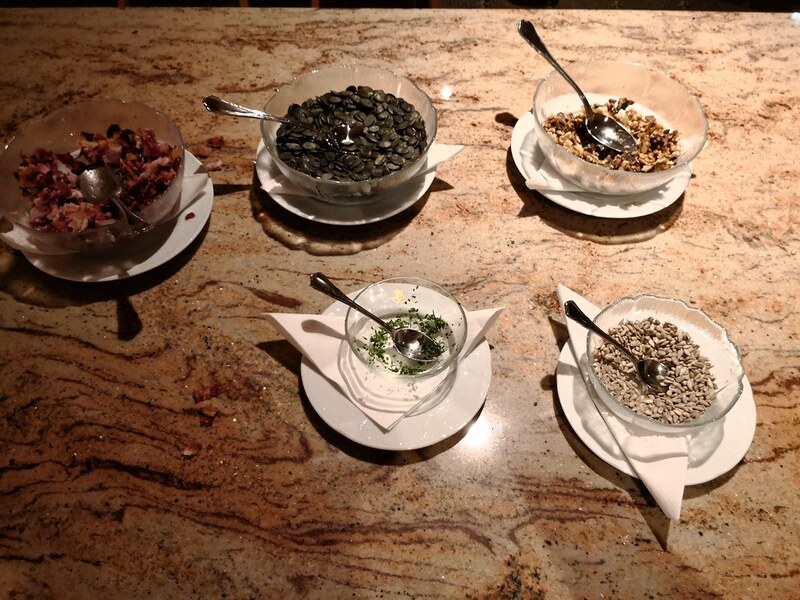 As far as the salad bar goes, it was a highlight every night and one I certainly enjoyed. Recommended dinner times was between 7 to 8:30pm, with most guests starting the meal at 7pm when the restaurant re-opens for dinner. 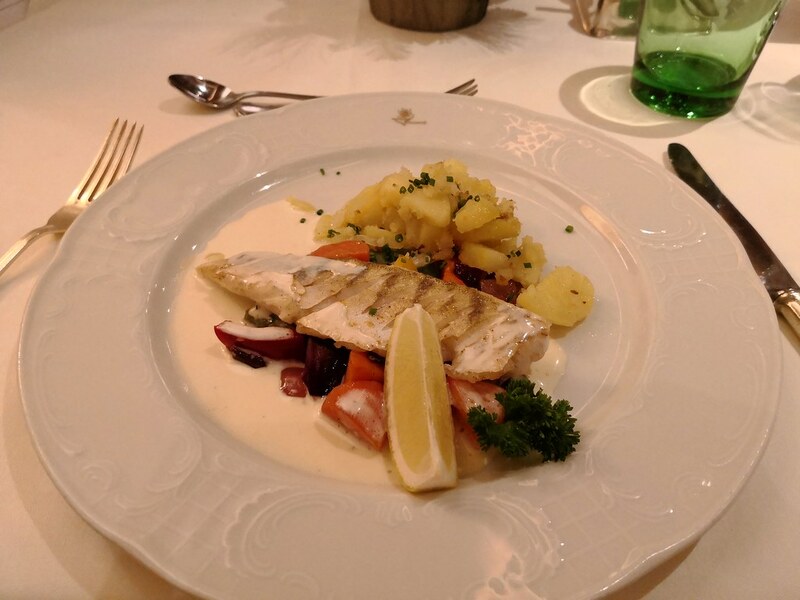 During the 5 days I was there, one of the dinner was a Tyrolean Farmer’s Buffet which I would write about later on this post. On other days, it is a 5-course meal that includes the salad buffet I mentioned above. 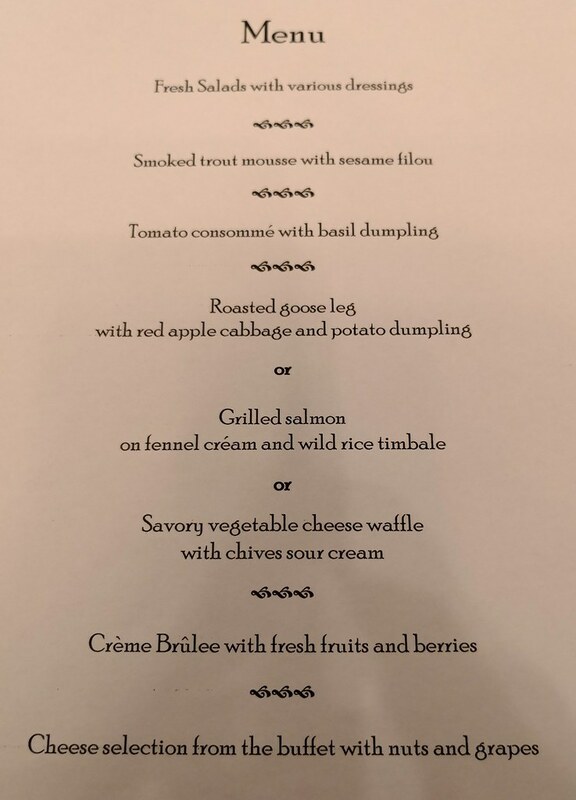 The course dinner includes a fixed appetizer, a soup course, a choice of main course that would be a meat, a seafood or a vegetarian option, and ending with a dessert option with cheese. While I would not post all the menus here, they can be found in my Flickr photo album on my stay in the hotel. On some days, the menu could list an appetizer buffet or a dessert buffet in lieu of the fixed appetizer/dessert. The appetizers served during dinner are usually quite light and they have a neutral taste profile that should be alright with most diners. 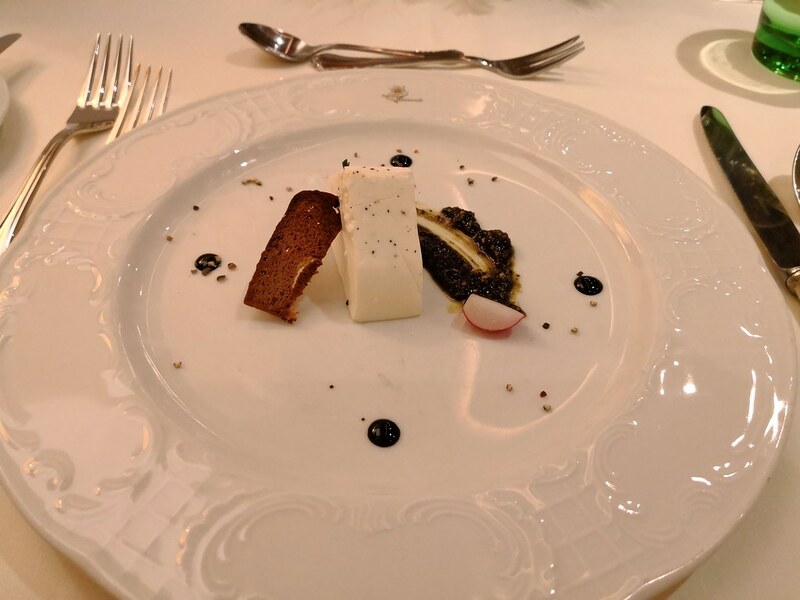 On the first night it was a smoked trout mousse and the second night it was a feta cheese terrine. My favourite kind of appetizer was the grilled octopus served on the day they had appetizer served from the buffet alongside the salad bar. For the soup course, they could range from clear broths to creamier options. 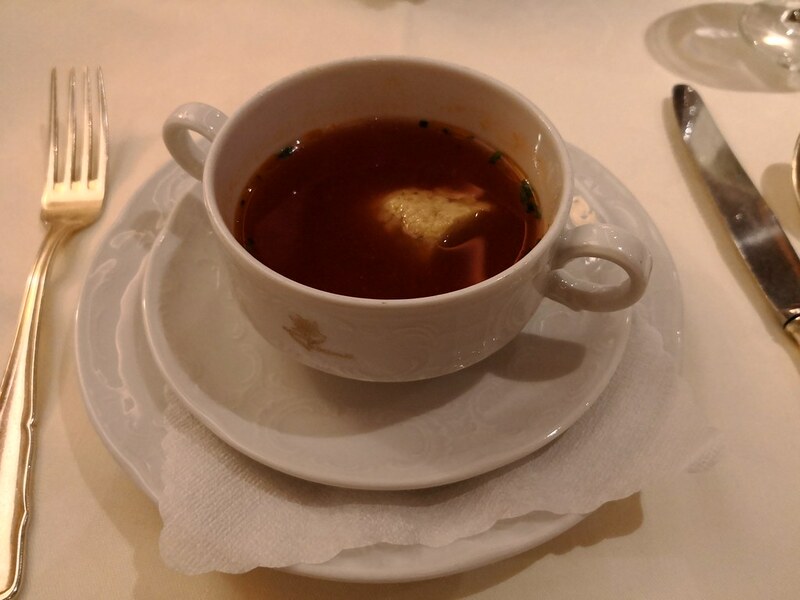 While I show the tomato consommé and the rucola foam soup here, there was a simple chicken soup with lemongrass and mushrooms that was Asian in style and flavour. 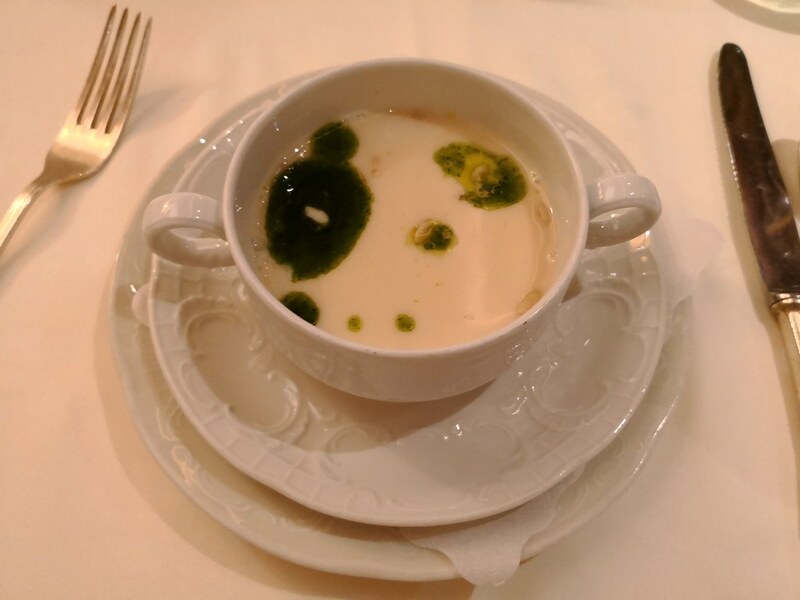 Perhaps the most noteworthy soup here is the rucola foam soup that has a nice presentation with a flavour that I enjoyed as the other soup was more forgettable or I had a better version elsewhere. 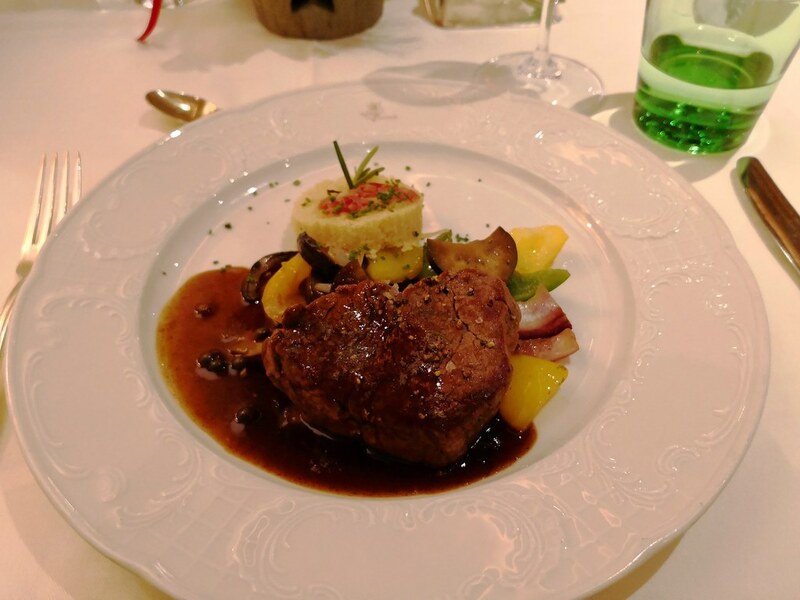 Amongst the main courses, I had a roast goose leg, a pike perch fillet, a roast leg of lamb and a sirloin steak on the 4 days. If you notice, I tend to go for the meat option though I do have to say most of the time there was 2 options I can see myself eating. There was even an Asian inspired noodle option on one night. 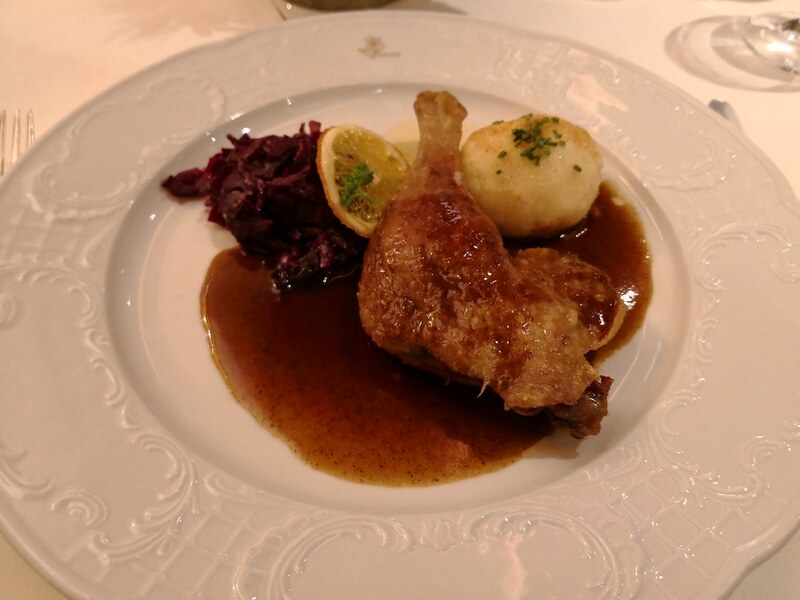 Amongst the 4 main courses I tried, the roast goose leg and the leg of lamb stood out here as the meat was tender. 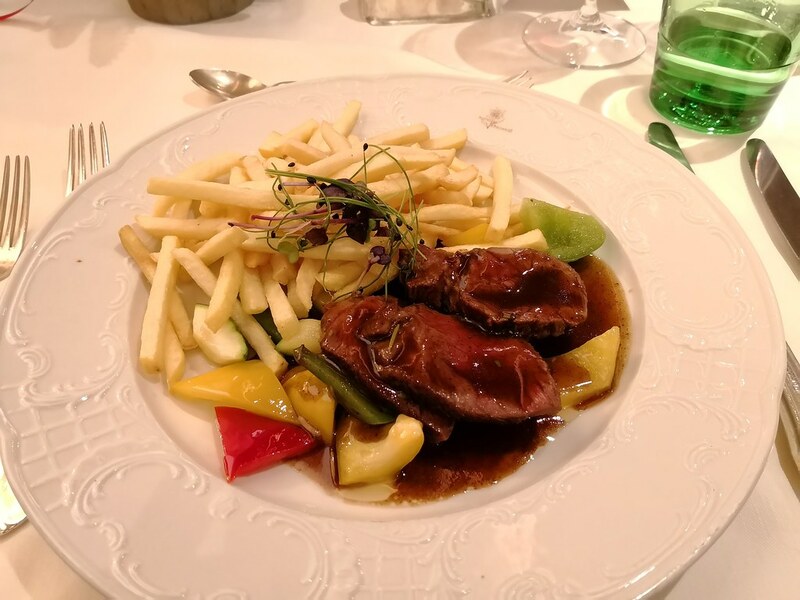 For diners who prefer a classic side dish to the main course, I was able to get a hearty portion of French Fries to replace whatever side dish since French Fries are served for the kids meal and they are readily available as well on the kid’s buffet. To end the meal, guests are offered coffee or tea along with desserts. 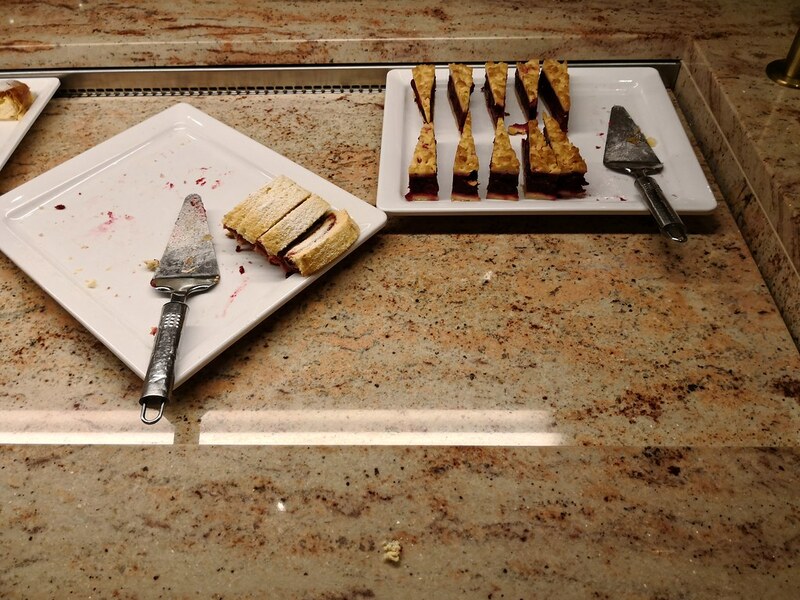 On one of the dinner where a course meal is served, diners get a dessert buffet as well. 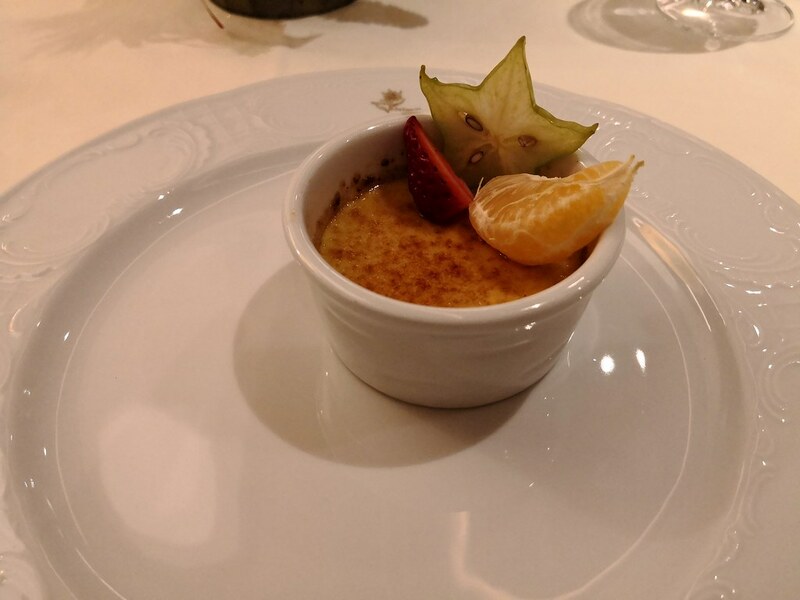 The dessert course are usually quite lacklustre and just plain average. 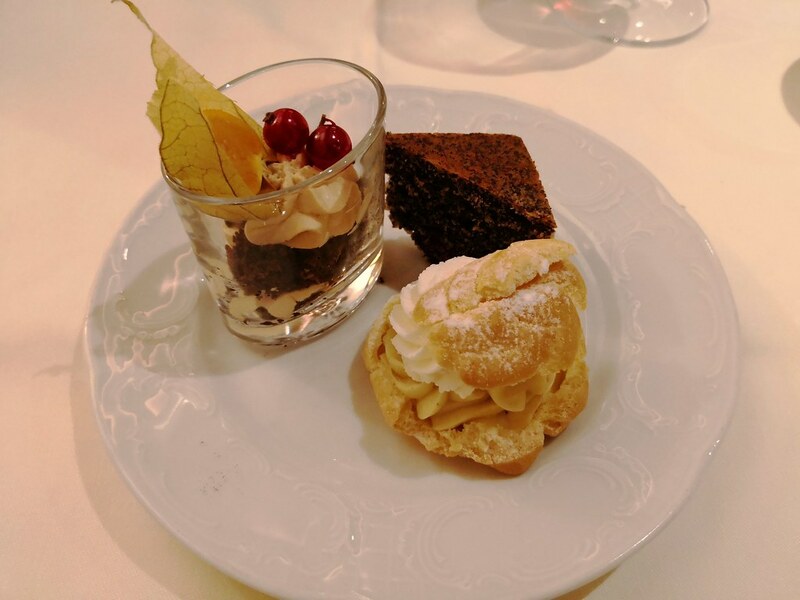 My favourite dessert was perhaps the chestnut mousse which also has the best presentation of the bunch and the mousse served on the small shot glass during the dessert buffet. 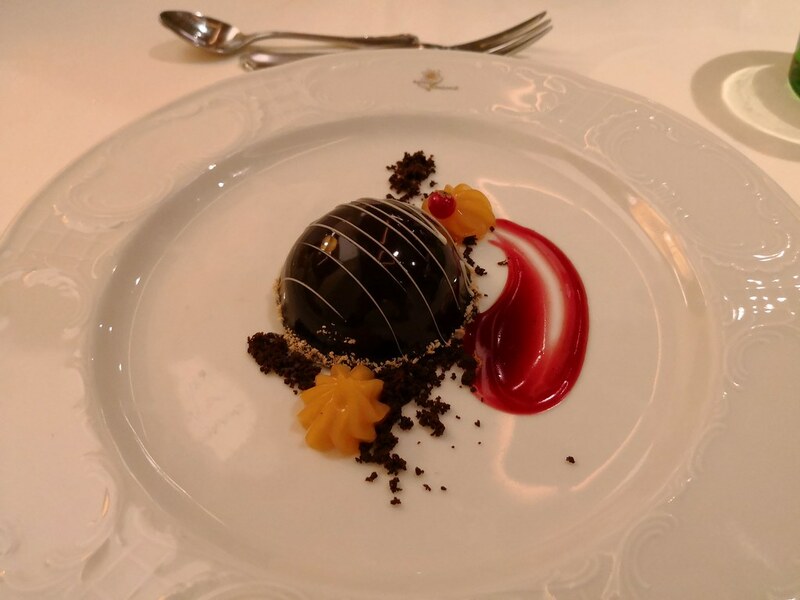 Other than that, I cannot say I miss any of the desserts here, and that is coming from someone who enjoys desserts! 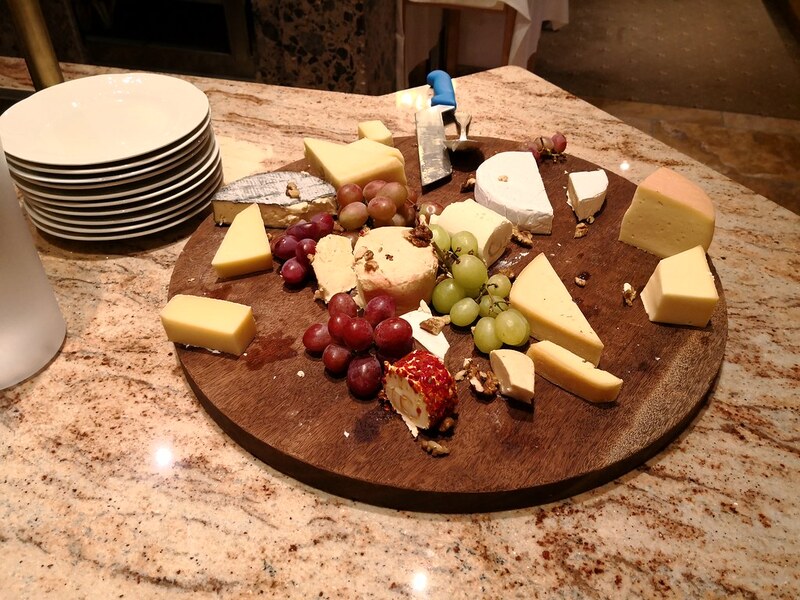 Finally there is a cheese board with some grapes that guests can help themselves to but as I am usually full by this point, it was something I skip most of the time. 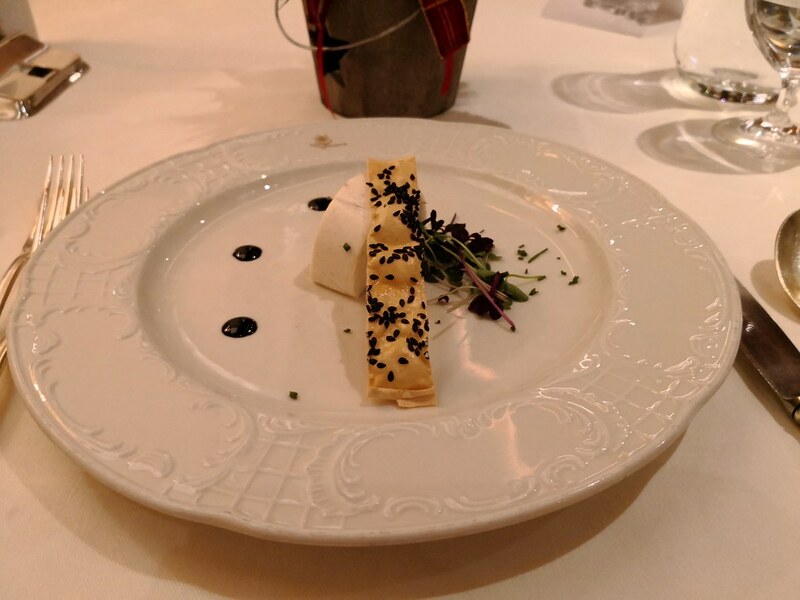 If I must say the presentation of the cheese was not too appealing either which is a reason to skip it here especially since I am not a big cheese eater. While I was not travelling with any children, they get a special kids’ menu and buffet section. 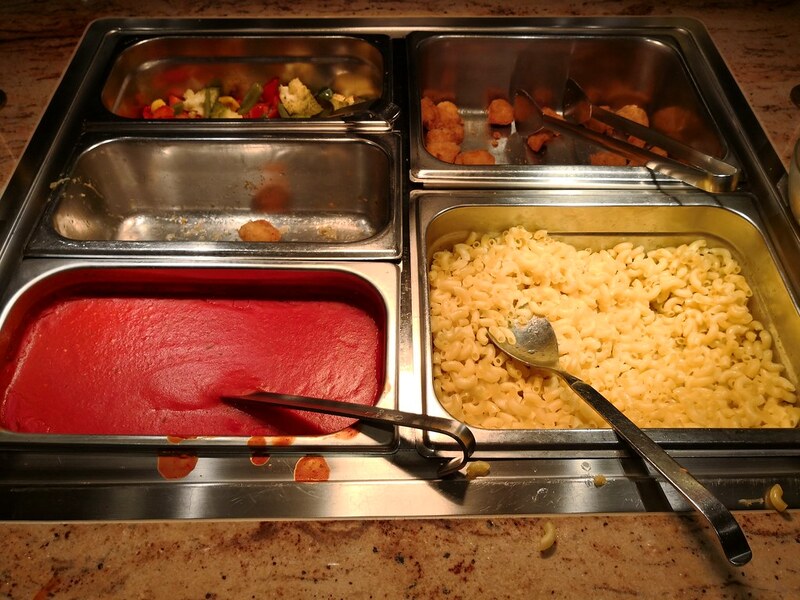 I took a photo of their buffet section on one of the days and there is usually a pasta choice, some nuggets and fried potato balls along with stir-fried vegetables and plenty of tomato sauce. For adults who are maybe tired of the course dinner, I do not believe they will prohibit you from trying these kiddy treats! 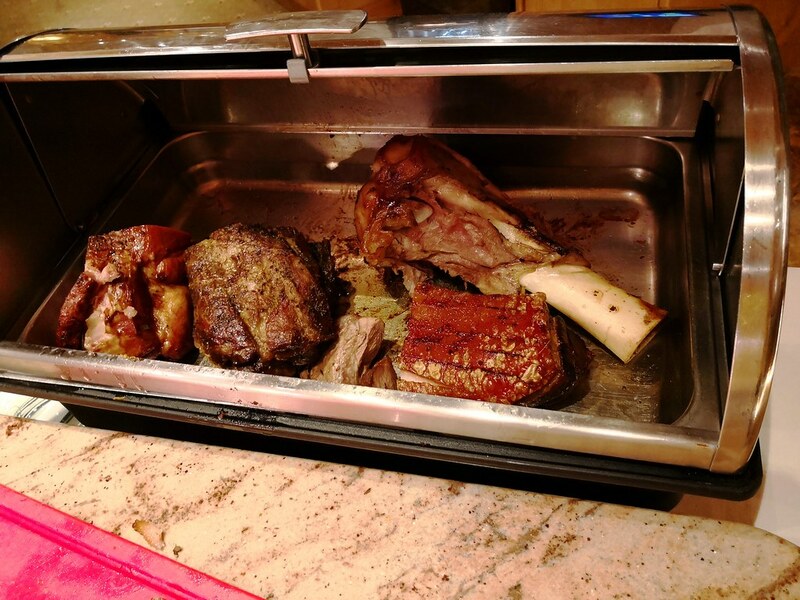 To add in to the variety, the hotel does a buffet night once a week since most visitors stay here for the week during a skiing vacation. 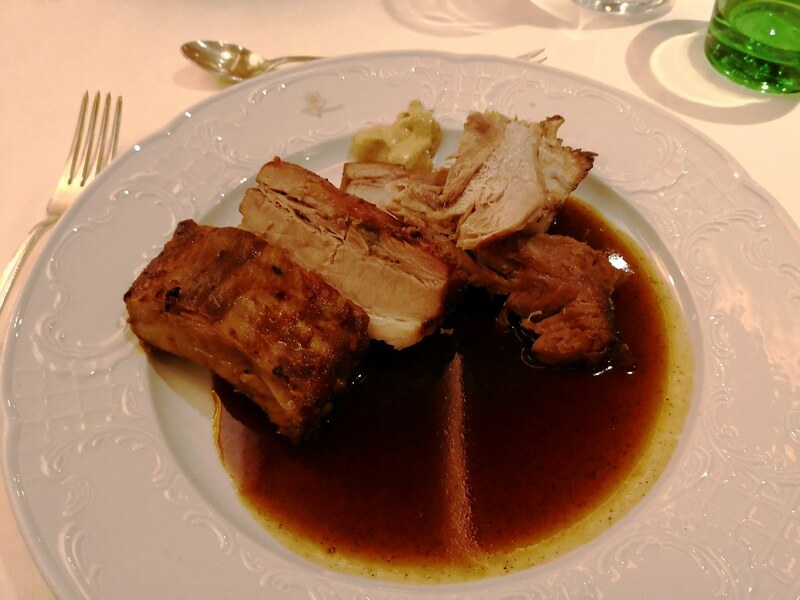 In this instance, it is certainly recommended to arrive for dinner at 7pm since the popular dishes can get cleared up quickly. 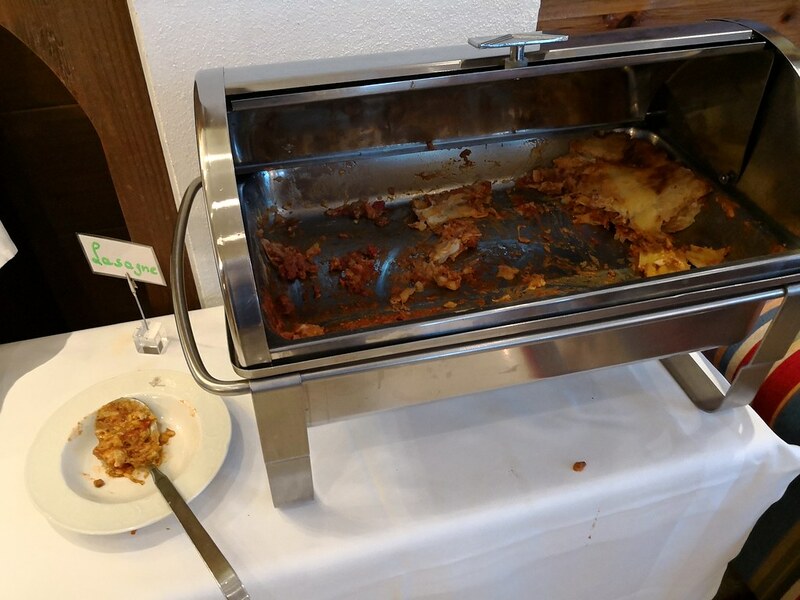 As the name of the buffet suggests, the farmer’s buffet is very meaty and guests who are vegetarians best co-ordinate with the hotel for a vegetarian platter in advance. 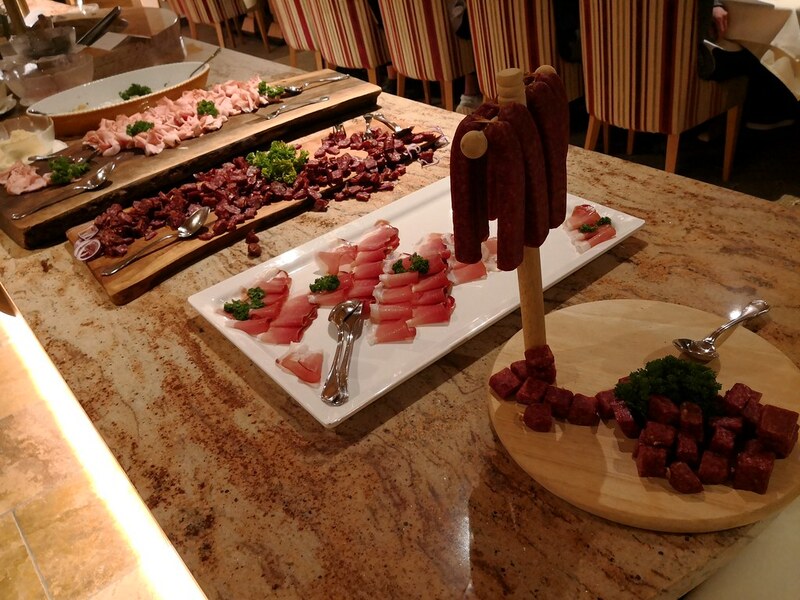 There is a salad bar as usual here but the appetizer has plenty of cold cuts and cured meat with the Tyrolean speck from breakfast making its way to the buffet counter again. 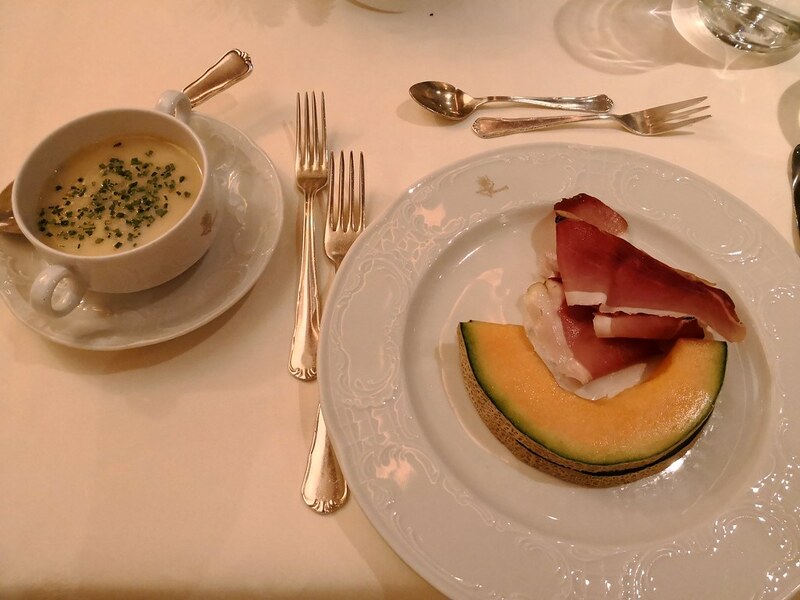 In addition to meaty appetizers, there was soup and cantaloupe from the buffet so it was easy to create a speck and melon dish as appetizers. 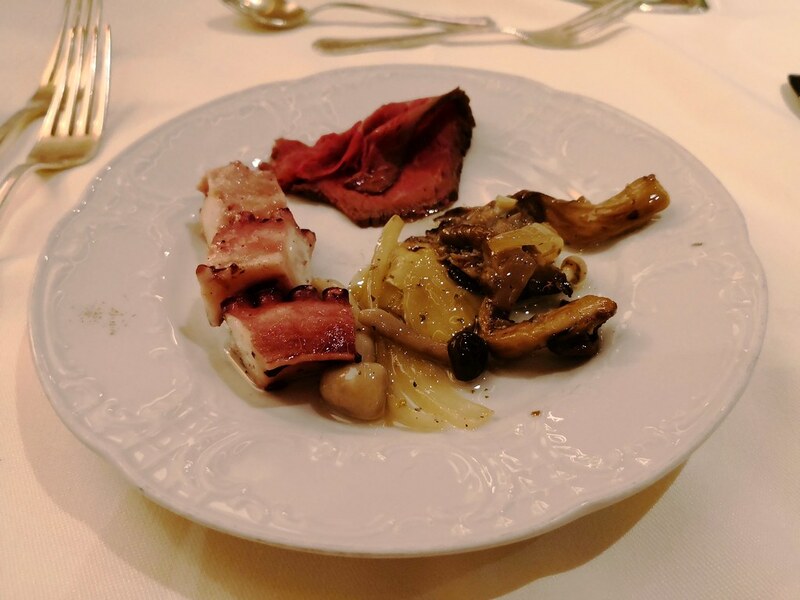 On the main course, there was some pasta choices as well as a selection of meat like lamb leg and roast pork to choose from. These meat will be sliced on demand and are served with potatoes and gravy, making for a hearty main course. 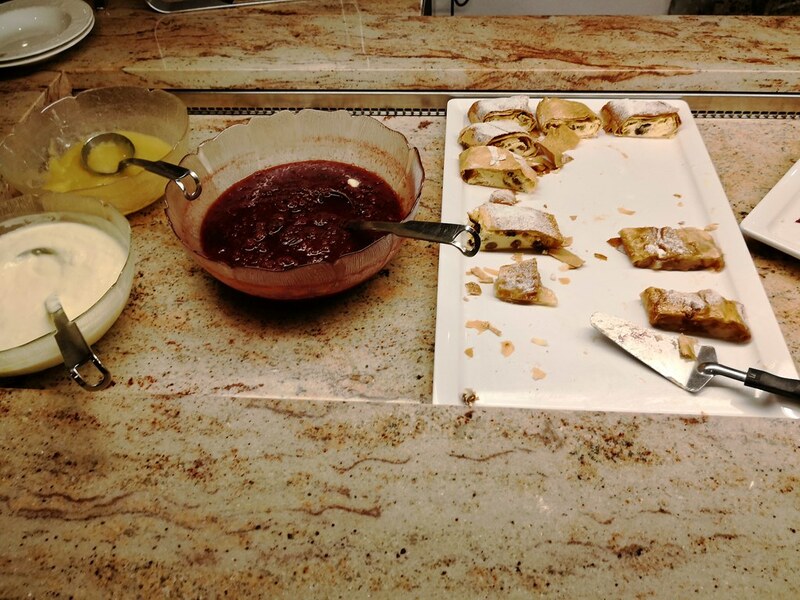 For desserts, there was choice between strudel complete with the berry compote and vanilla cream, and a selection of roll cakes and tarts that are thinly sliced so diners can get a couple to try. 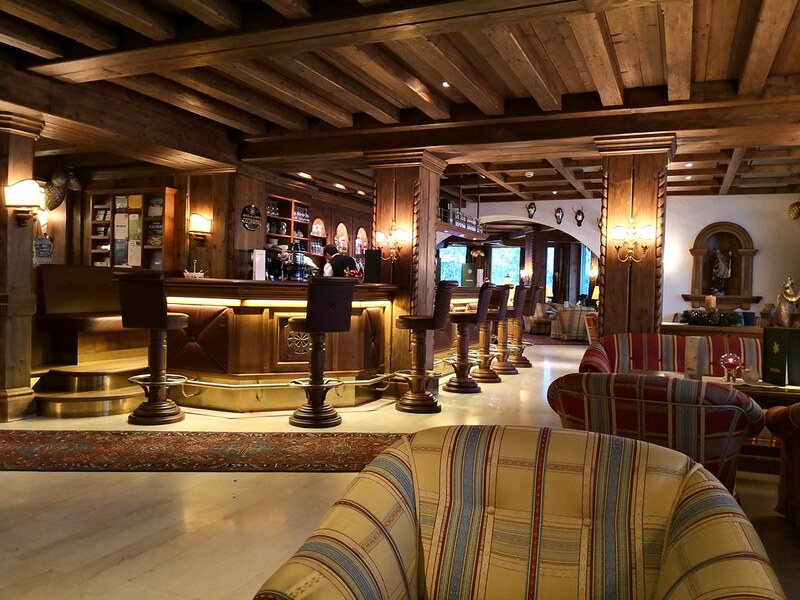 After dinner, some guests would like to unwind either in the cigar room if they want to smoke or just relax over a couple of drinks in the bar and lobby lounge. 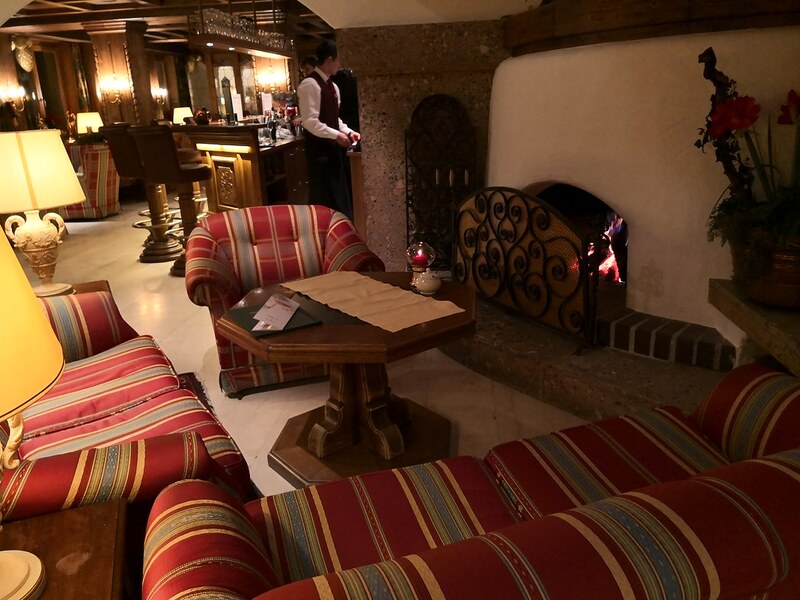 The lounge itself is comfortable with plenty of oversized sofas and armchairs, and it even features a fireplace. 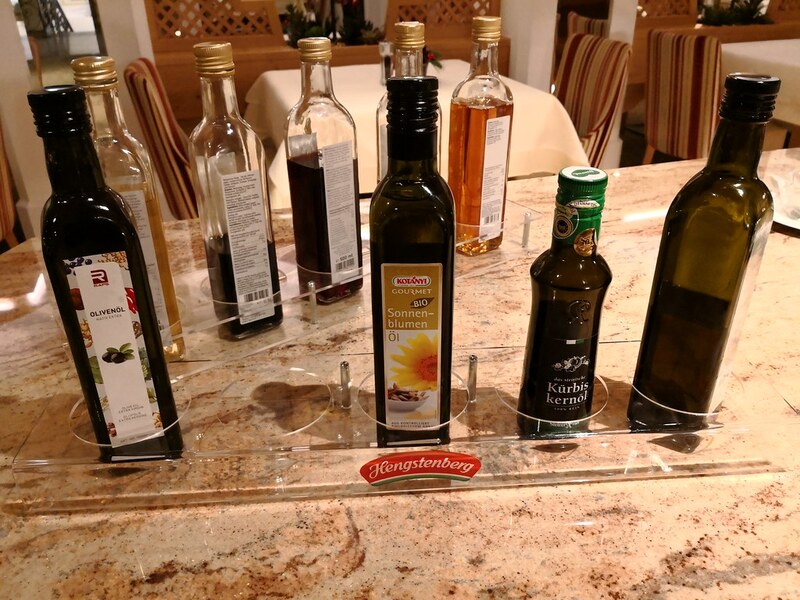 Drinks list in the hotel is respectable with plenty of wines including some specialty Austrian dessert wines. What they lacked is a range of tasty cocktails or non-alcoholic drinks, and for that matter, I tend to usually purchase some drinks to enjoy back in my room. 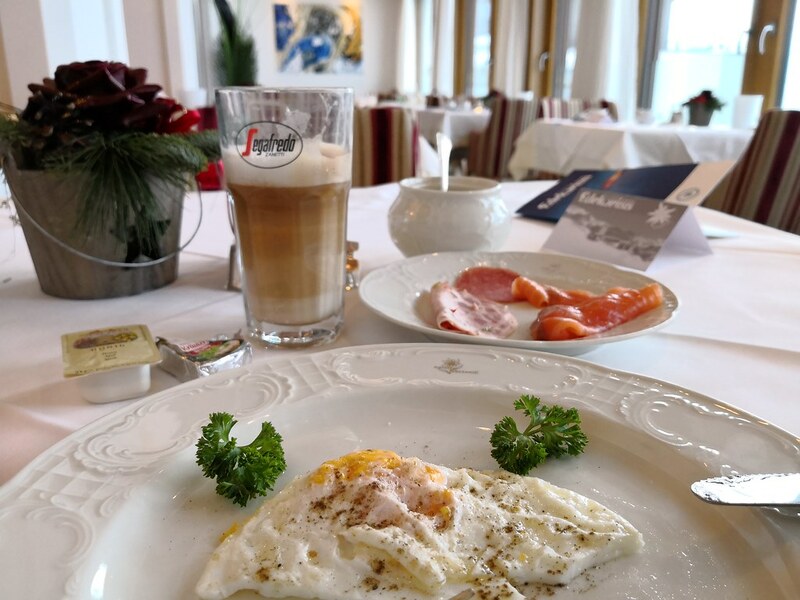 In all, the nightly rate I paid was around EUR246 (~$305) net including breakfast and dinner. Upon check-out, I was also presented with a gift of a wine glass. With the half board valued at around EUR80 daily, the rate was around EUR160 which is reasonable for a ski-in, ski-out property. The only reason it lacks in value for money per stay is that I would not call the stay perfect and do remember this is the rate for a single occupancy with double occupancy becoming even higher. With regards to the imperfections, there was some lack in quality in the amenities provided such as weak wifi signals in the room and limited food choices for breakfast and snacks. There was also no turndown service or in-room amenities that would signal it as a four-star and higher property. As such the cost of the rooms seems tied to the location of the property, and that is all fine but would not represent good value. 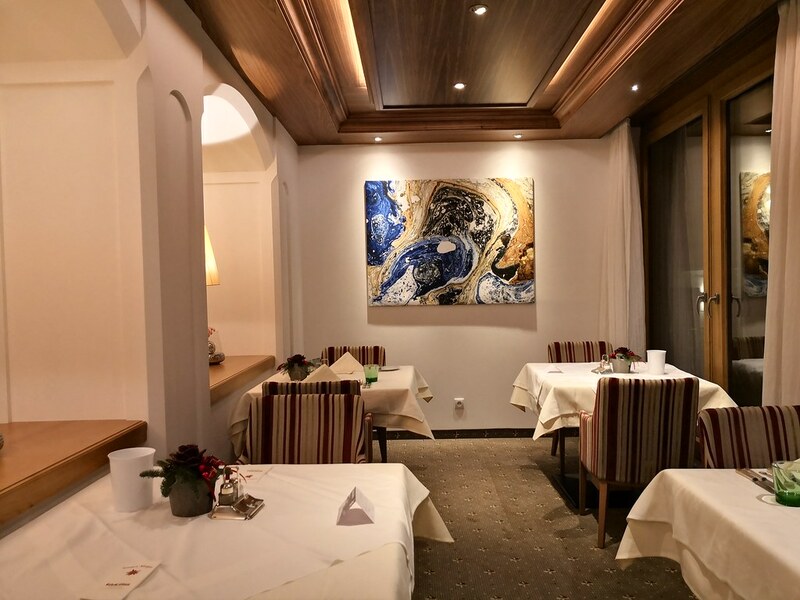 This property is recommended if it suits your budget and you are fine with the limited amenities, for I believe there are several more luxurious choices in Sölden itself and around Hochsölden.